Three Magnetic Delay Types, Reverb, Sound on Sound, and More. 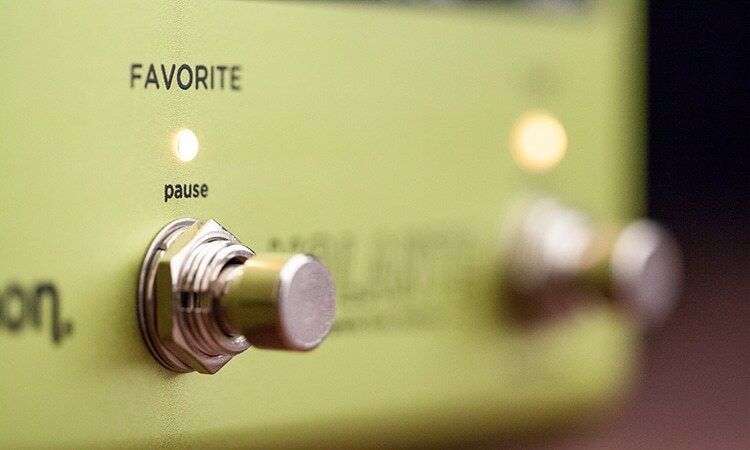 Delivering truly exceptional sound quality and intuitive playability, Volante is designed to radically enhance the sonic expressiveness of your pedalboard. Featuring magnetic drum echo, tape echo, and reel-to-reel studio echo, Volante is a stereo multi-head delay that also offers a Sound on Sound mode and a vintage spring reverb algorithm. Volante’s powerful sound-sculpting controls provide limitless sonic possibilities. Some of the classic tape echo machines included small integrated spring reverb tanks tuned to limited bandwidth. For Volante, we captured this vintage vibe while creating a spring reverb algorithm with a gorgeous, gentle character that stands on its own, in addition to enhancing delayed signals. In the video below, Strymon sound designer Pete Celi gives you a tour of Volante’s features and functions. REC LEVEL – Controls the analog gain of the signal fed into the record head. LOW CUT – Controls the low frequency shaping of the echo repeats. ON – Engages and disengages effect. Press and hold for infinite repeats. In Sound on Sound mode: Reverses playback. Press and hold to enter infinite mode which disables the record head and plays the most recent loop without degrading. MECHANICS – Controls the amount of mechanically related speed fluctuations and media irregularities including friction, creases, splices, and contaminants. WEAR – Controls the wear of the media and playback heads which affects the fidelity of the high frequencies. Set to minimum for a fresh, full bandwidth sound. TYPE – Selects between three available magnetic media types. drum: Steel wire spinning platter. Atmospheric echoes emphasize the low-mid frequencies and will saturate with hot signals or high feedback. tape: Magnetic tape used in vintage echo machines. Warm tape response with moderately clean and airy signal path. studio: Clean studio grade tape used in reel-to-reel units. playback – Selects which of the individual playback heads are engaged. Head Volume: Press and hold for one second to toggle between half and full volume. GREEN LED ON = full volume. AMBER LED ON = half volume. feedback – Enables or disables feedback of the corresponding playback head signal to the record head. Panning: Turn the TIME knob while pressing and holding the individual feedback buttons to adjust the panning for each playback head. Adjusting the knob to twelve o’clock returns the head to the center position. FAVORITE – Press to recall active favorite preset. In Sound on Sound mode: Pauses the loop. Press and hold to stop and start loop playback with added ramp up and ramp down effect. TIME – Controls the delay time at head 4. Heads 1-3 subdivide proportionally according to the SPACING setting. Delay time ranges vary by selected SPEED setting. SPEED – Affects the fidelity and mechanical response of the selected TYPE. Changing the SPEED switch will also result in a proportional change to the delay range of the TIME knob. REPEATS – Controls the feedback amount for the heads that have their feedback enabled. SPACING – Adjusts the spacing between the heads. Turning the knob morphs the heads in between the marked settings. ECHO LEVEL – Sets the overall delay signal level sent to the output. SPRING – Controls the output mix of the integrated spring reverb tank. Reverb is applied after echo. TAP – Sets quarter note delay time for playback head 4. The TAP LED will flash to indicate the delay time in quarter notes. INPUT MODE – Sets the INPUT level. Use INST with guitar level input. Set to LINE when using Volante in the effects loop of a guitar amp, or when driving Volante with a hot output from a synth or mixer insert. INPUTS – High impedance audio inputs. Use LEFT IN for mono input. Connecting a jack to the RIGHT IN will automatically set the pedal to output in STEREO. OUTPUTS – Audio signal outputs. Use LEFT OUT for mono output. See complete user manual for additional details. EXPRESSION – Connect an expression pedal, external TAP switch, 1/4" to MIDI cable, or MultiSwitch Plus for additional external control. USB – Used for connecting to a computer for controlling via MIDI. MIDI – Full featured MIDI input and output supporting MIDI CCs, program changes, and more. POWER – Use included power supply or any adapter with the following rating: 9VDC center negative. 300mA minimum.